A blockchain-powered daily fantasy sports platform, MyDFS promises to improve the gaming experience for the uncountable amount of fantasy sports enthusiasts around the world by delivering better speed, ease-of-use, transparency, governance, and accountability. This mobile-based fantasy sports ecosystem has been created by the founders of uTrener and KHL Fantasy, two of European earliest and most popular daily fantasy sports platforms. 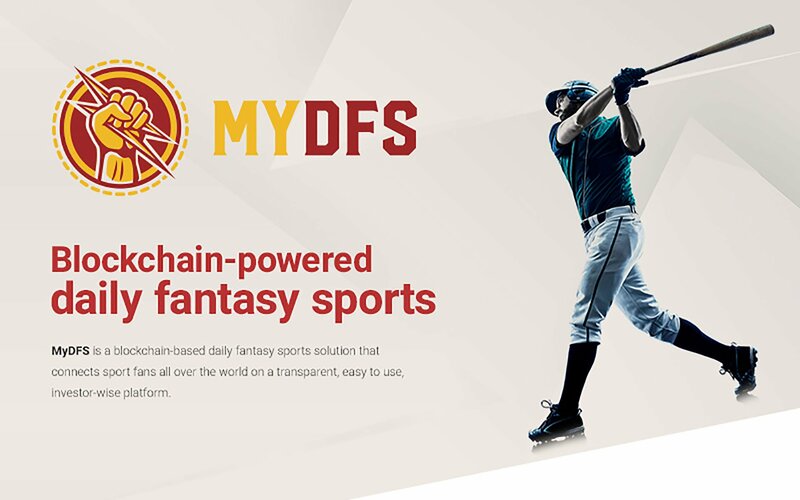 MyDFS, a blockchain-powered daily fantasy sports platform, is all set to redefine the industry by connecting the sports fans around the world to an ecosystem that is transparent, easy-to-use, and token buyers friendly. Built on smart contracts, MyDFS runs on mobile devices to address a number of issues that have plagued the fantasy sports industry. The ultimate goal of this project is to simplify the user experience to make the games enjoyable for all types of players. The global fantasy sports industry has experienced phenomenal growth over the last few decades. Only in the US and Canada, this market was worth $7 billion in 2017. However, an extremely high growth rate has led the industry to an immature state where outdated business practices are commonplace. As a result, this highly promising industry has been struggling with several shortcomings including uncertain legal status, complicated gaming experience, complex verification procedures, deposit and withdrawal-related issues, and lack of transparency. Get profits from winnings in tokens. The MyDFS team comprises of industry professionals with a wealth of experience in the fields of fantasy sports and large-audience applications. In 2016, this team hit the headlines by developing and launching uTrener. This was one of the earliest platforms on the European market to offer a refined, user-friendly and seamless DFS gaming experience on iOS, Android, and the web. They have also launched KHL Fantasy (later KHL Haier Fantasy), a white label app for top European ice hockey league KHL. KHL Fantasy won MarSpo 2017 as the best sports app and was featured by App Store several times. At the same time, MyDFS team received UK Gambling Commission License to legitimately operate fantasy sports in Europe. MyDFS currently supports soccer, hockey, basketball, cricket, and football, and is capable of integrating more popular sports in the future. It works on all contemporary smartphones, tablets, and the web. MyDFS token, an Ethereum-based token, will be used for all value transactions within the MyDFS ecosystem. These tokens can be used to play, win, and exchange it for other cryptocurrency or fiat money. The users can also hold and trade their tokens, maximizing their earning potential as the demand increases for the MyDFS tokens. Moreover, MyDFS is pioneering player brokerage to let casual users share their prize pool with a pro-players’. MyDFS app is expected to be released before the FIFA World Cup 2018 to be held this summer in Russia. The company has recently started its pre-ICO campaign, offering a total of 50 million tokens with a hard cap set at $40 million. Attractive bonuses are available for the early token buyers. MyDFS is a blockchain-powered daily fantasy sports platform from uTrener and KHL Fantasy apps creators. It runs on mobile devices and connects sports fans around the world in a transparent, easy-to-use manner. The platform simplifies the user experience to make the game enjoyable for players of all types. MyDFS is also pioneering player brokerage to let casual users share their prize pool with a pro.